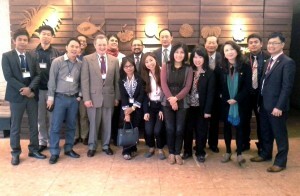 In March, Medica held a Southeast Asia Distributors Sales Meeting in Taipei, Taiwan. Distributors attended from Myanmar, Taiwan, Philippines, Indonesia, Vietnam, and Korea. Meeting goals included launching EasyRA in Southeast Asia and increasing sales through various marketing programs supported by Medica.